The Election is not “over until the fat lady sings,” but your vote is in jeopardy! There is a massive voter fraud investigation in Texas. Hillary Clinton is working hard to get Democrats in Congress by spending $10 million dollars against their Republican counterparts in various races across the country. Her “war chest” is said to be more than double that of the Republicans. The Star-Telegram reported that Tarrant County, Texas is in the midst of the largest voter fraud case in their history. It involves the mail-in ballots during the primaries. Texas law only allows people to witness one mail in ballot per person. They received 131 mail in ballots, some of them “witnessed” by the same people 4 or 5 times. “Ballot-harvesting” as it is called is illegal in Texas and has been since 2013. Republicans sent out an emergency alert to their supporters, asking them to volunteer as poll watchers. The Democrats think it’s all hype, of course. But if the investigation finds that fraud has been committed, Texas voting laws may be changed once again. So I guess it’s just too bad if someone’s vote is destroyed by fraud. During a conference call Monday morning, Clinton’s campaign manager, Robby Mook, announced plans to spend an additional $6 million on coordinated party efforts in the battleground states of Florida, Iowa, Ohio, Pennsylvania, Nevada, New Hampshire and North Carolina. The spending will be focused on mail and digital media outreach to try to get out the Democratic vote in those states, all of which are seeing competitive Senate contests this election. The governor’s races in North Carolina and New Hampshire also look set to go down to the wire. So they are outspending the Republicans 2 to 1. What does that mean? It means that they are trying to delete our votes by using money. None of that counts the George Soros factor and the dirty tricks he is pulling by paying people to lie, cheat, disrupt, and otherwise destroy Donald Trump. This war is NOT over, but your vote is in jeopardy! 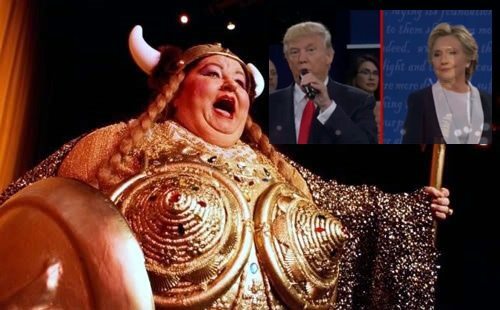 Remember it’s not over until the fat lady sings. And Hillary may be counting her cards and believing she’s won already, but YOU get to be the deciding factor. From lies and dirty tricks to outright fraud, the Democrats have pulled out all the stops to prevent an outsider from getting into office. We have repeatedly reported on the activities of the Demo-rats. Turn out for the polls en masse and show them their plans will not prevail!